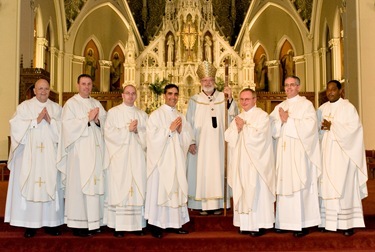 Saturday, seven very fine men were ordained for the priesthood in service of our people, which was a great joy for the archdiocese. 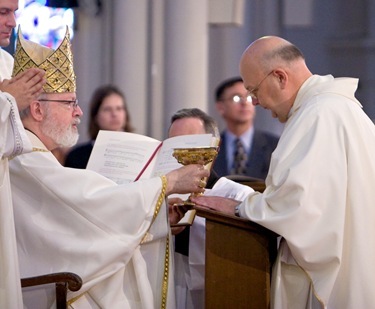 Ordinations are always a great time of rejoicing and thanksgiving for the Church because we are a eucharistic Church and the priesthood is the way Christ makes the Eucharist present throughout the world. 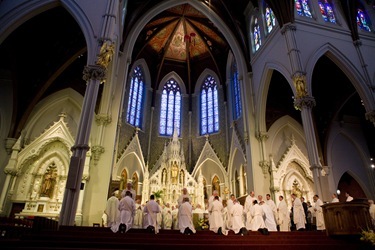 This year, the attendance at the Cathedral of the Holy Cross was fabulous, and about 140 of our priests were able to come. 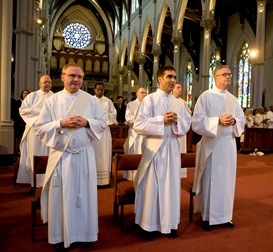 The cathedral was filled with many, many priests. For the first time, we ordained an Ethiopian candidate, Father Tamiru Atraga. Many members of the Ethiopian community were at the ordination, and Father Tamiru will be bi-ritual so that he can celebrate Mass for the community. We have an Ethiopian-Eritrean Mass at the cathedral every week in the Ge’ez Catholic rite. Msgr. Paul Russell, the Boston priest who helped Father Tamiru enter our seminary, returned from Nigeria to be present at the ordination. He is being named chargé d’affaires at the embassy in Taipei, Taiwan, which is a great honor and distinction — a recognition for the fine work that he has done on behalf of the Holy See. 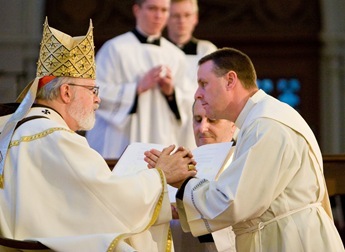 Vocations to the priesthood are, of course, a very important priority for our archdiocese. 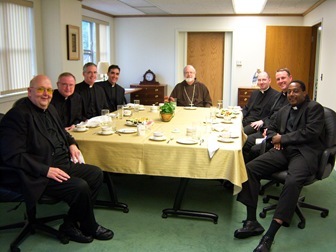 We are very grateful for the wonderful work being done by our Vocations Office and very pleased that the number of young men in formation at St. John’s Seminary in Brighton has increased dramatically in the last couple of years. We also had members of the newly-founded local Serra Club chapter present for the ordination along people from parish vocation committees. 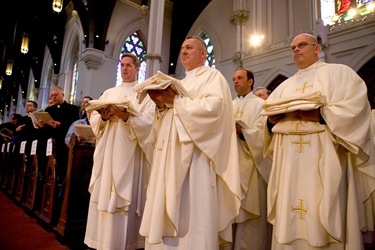 This year we celebrated this wonderful ordination ceremony on the eve of Corpus Christi, which was very beautiful for the new priests because they celebrated their first Masses on such a wonderful feast day. 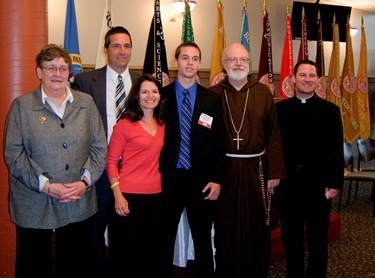 Later in the week, I had a luncheon with the newly ordained priests, their families and seminary faculty. Each year it is an opportunity to meet their loved ones and congratulate them. 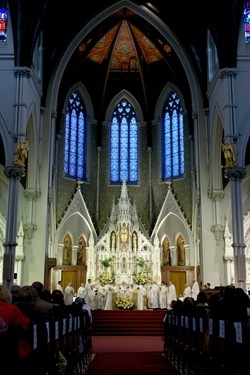 Saturday afternoon, I celebrated a lovely Mass at St. Ann Parish in Dorchester. 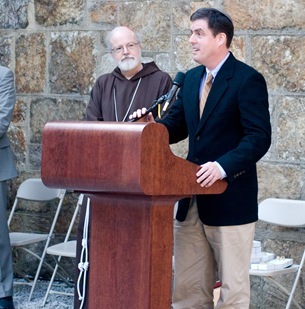 The current pastor, Father Tom Foley, was there and will be coming to work in the chancery. 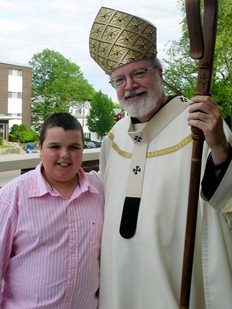 Father Sean Connors, the incoming pastor, was also present. I noticed that in the church there was a rose window with the image of the lamb and a depiction of a pelican on an altar. 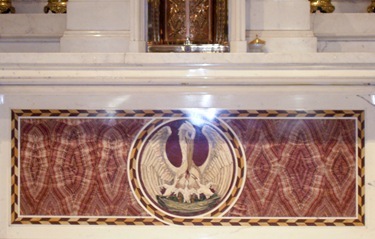 In my homily I explained the symbolism of those images. I told them that the Lamb of God, of course, is a very biblical image for Christ that comes, first of all, from John the Baptist who points out Christ to his disciples and says, “Behold the Lamb of God.” That phrase actually appears six times during Mass; five in the English Mass. It alludes to the paschal lamb of Exodus where the blood of the lamb on the doorposts brings deliverance to God’s people. Then, the lamb becomes the center of the Seder meal to remember God’s saving action, and Jesus is the lamb at the Last Supper. The pelican is a lesser-known symbol for Christ that comes from the Middle Ages. It really resulted from people misinterpreting the behavior of pelicans. People saw the pelicans feeding their offspring and thought the pelican wounded itself so that its blood could nourish the young. Of course, we understand now that pelicans catch fish, predigest them and then feed them to their young. Jokingly I asked the people if they like sushi; I don’t, but pelicans do! In any case, people saw the blood and thought the pelicans fed their own blood, and therefore it became a symbol of Christ who has wounded himself to feed us. 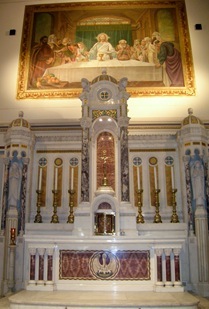 It’s a beautiful eucharistic symbol that is not biblical but comes from the tradition of the Church. 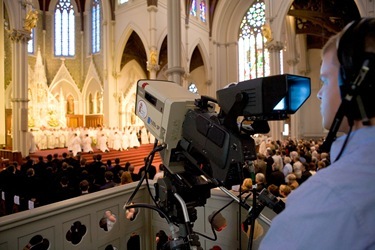 St. Thomas in beautiful poetry and songs for the Feast of Corpus Christi, calls Christ “Pie Pelicane Jesu Domine” which translates to “Pious Pelican, Jesus the Lord”. 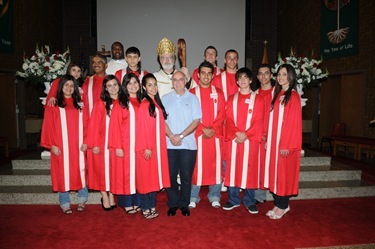 That evening I went to St. Tarcisius Parish in Framingham for a confirmation for the Brazilian community. 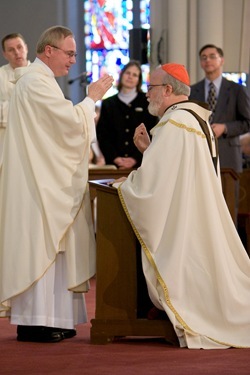 Members of that parish and some from other parishes as well were confirmed. The church was filled. The Brazilians love to sing, and the confirmation lasted for over two hours. I have four Brazilian confirmations this month. One practically every Sunday and I’m happy to be able to do them! The first was at St. Tarcisius, which has a very large Brazilian community. They have a wonderful community that is a great blessing for us. 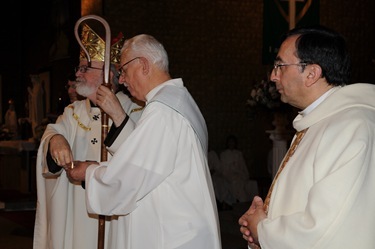 The pastor there, Father Joseph Pranzo, and the vicar, Father Heitor Castoldi, are members of the Scalabrinian fathers and are doing a fantastic job in that parish. It was originally an Italian parish and now has become very heavily Brazilian. 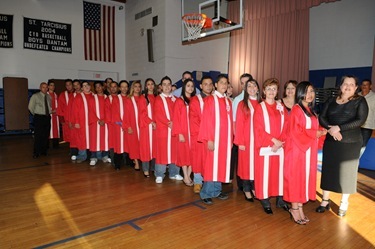 The Scalabrinian’s charism has always been to work with immigrants, and they do such fine work, not just with Italian immigrants but with Haitians, Brazilians and Hispanics. 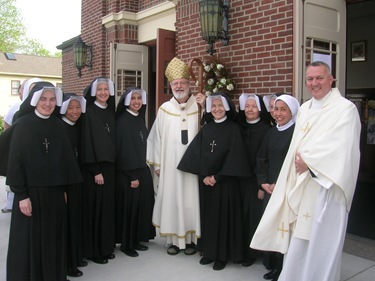 They have been a great blessing for the archdiocese. We had Mass for the presbyteral class of 1958 in celebration of their 50th anniversary. It was wonderful. 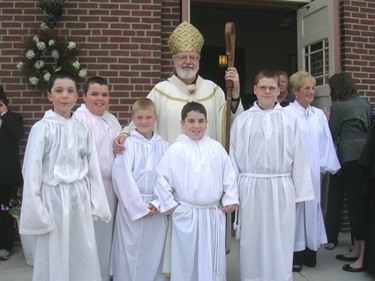 So many of the priests from that class from other dioceses actually were there. One priest, Msgr. John Ecker, came all the way from Yakima, Washington. 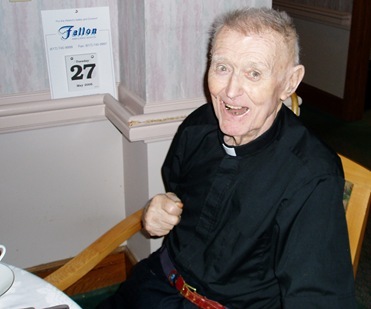 Father Clem DuFour came from Diocese of Fall River and priests from other parts of New England were also there. 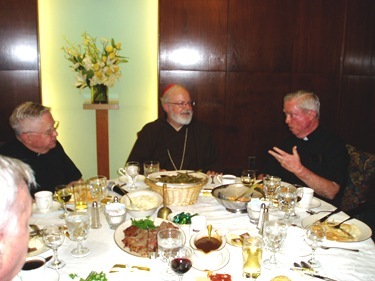 It is always a wonderful celebration, and there was a nice dinner afterwards. 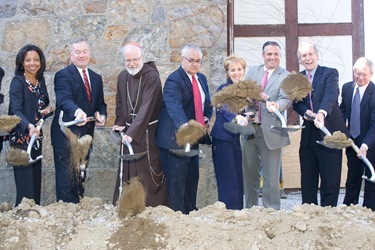 On Wednesday, I attended the groundbreaking for a mixed-income housing development that will be located at the former St. Aidan Parish in Brookline — the church in which John F. Kennedy was baptized. 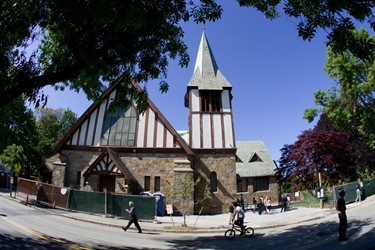 The parish has been closed for 10 years, and this project has taken a long time to come about. Lisa Alberghini, president of the Planning Office of Urban Affairs, and her office do a fantastic job of planning these projects which, over the last 40 years, have led to the development of 2,300 units of affordable and mixed income housing which provide homes for over 10,000 people. There are many Jewish people in the Brookline neighborhood, and Rabbi William Hamilton was there with us at the groundbreaking. Of course, we were also joined by members of the neighborhood associations, those involved in the financing and construction of the development, as well as elected officials who have supported this project. 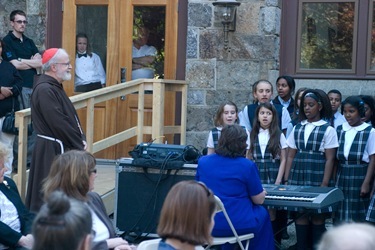 The children’s choir from St. Mary of the Assumption School sang “Dona Nobis Pacem” four-voice in Latin and in Hebrew. They did a wonderful, wonderful job. Everyone was blown away by their performance. 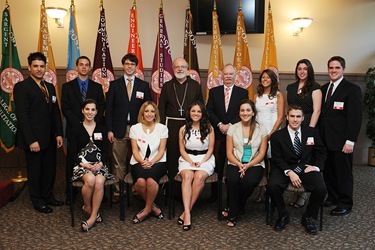 In the evening, I went to Boston University for the awarding of the Medeiros Scholarships, which are presented to 14 students from our Catholic schools each year. 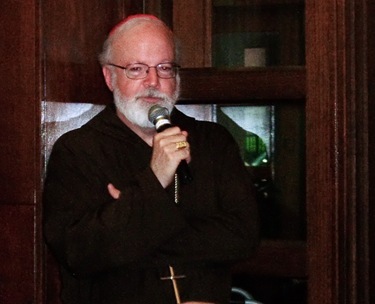 BU president Dr. Robert Brown made the presentations and spoke about Cardinal Medeiros. 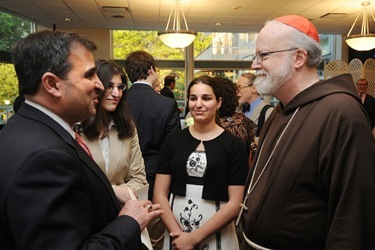 He pointed out that 300 young Catholics have received this wonderful, four-year full scholarship since it began in 1986. 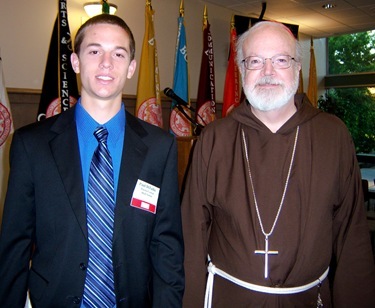 He also thanked Sister Clare Bertero and the other members of the committee who helped select the recipients. Dr. John Silber, the former president, was also there. I publicly thanked him for being one of the architects of this program. In my comments to the young people, I said that so much has been given to them that they must look for the opportunity now to give back. 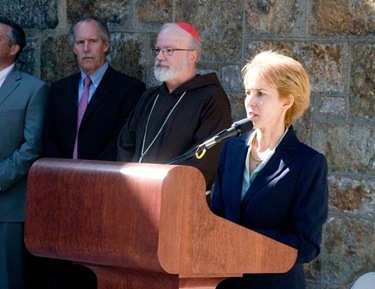 I encouraged them to be an active part of the wonderful campus Catholic community there at BU. The campus ministry is so strong there with the hard work of Father Paul Helfrich, the Brotherhood of Hope and Sister Olga Yaqob. On Thursday, James (Jim) Mooney Jr., Craig Gibson and Scot Landry joined me for lunch. 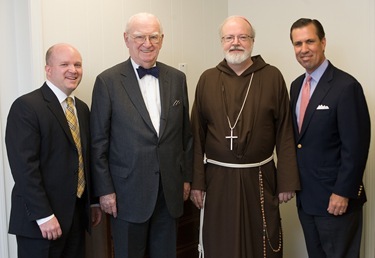 The lunch was to thank Jim for his many years of service as president of the Catholic Foundation Board of Governors and to welcome Craig as our incoming president. 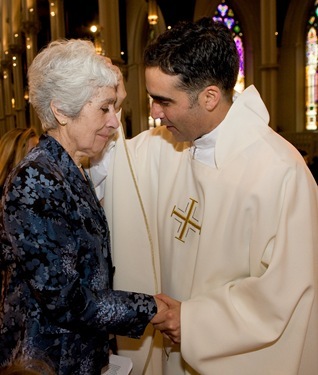 The Catholic Foundation exists to help fund the many important ministries, works and programs of our Archdiocese. 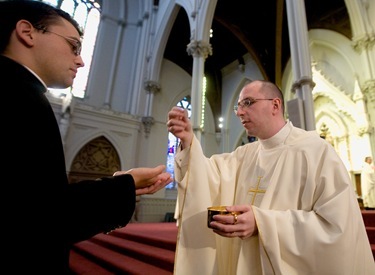 One of it’s major annual initiatives is the Catholic Appeal. 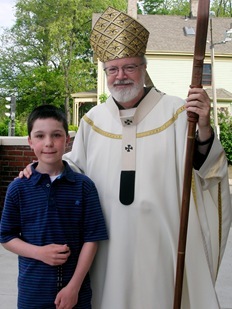 All of us at the Archdiocese are grateful for the hard work of Jim, Craig and many other board members as well as the professional staff of the Catholic Foundation. Well, that’s about all for this week. Until my next post, enjoy the improving weather and blessings to you all.